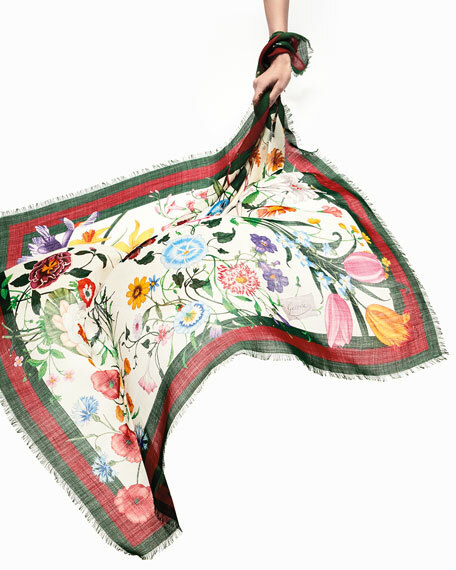 Gucci voile shawl in flora print with signature web detail. Framed edges with fringe ends. 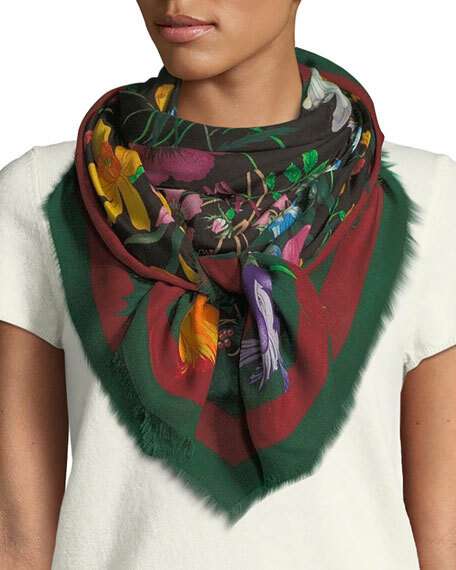 Gucci shawl in Flora Gothic print. Contrast border with "Gucci Amor Caecus" jacquard. Approx. 55" square (140cm). Fringe finish along edges. May be styled multiple ways. Wool/metallic fiber. Made in Italy. Gucci shawl in rainbow striped jacquard with Lurex?? metallic. Gucci and bee motifs along the borders. May be styled multiple ways. Eyelash fringe finish. Wool/polyester. Made in Italy. Model's measurements: Height 5'10"/177cm, bust 33"/84cm, waist 25.6"/65.2cm, hips 35.8"/91cm, dress size US 2-4/FR 34-36.